4th Grade have kept alive their hopes of a back-to-back title with a birth in next wees Grand Final in the highlight of our Semi Final weekend. The Adam Gummer led side defeated Minor Premiers Sydney University by 26 runs, moving them through to the decider against St George next weekend. If they win next weekend they will become the first ever grade side to go back-to-back in our history. Green Shield has done it twice in the 50s. Unfortunately our 3rd grade side were unable to bring home the biscuits and follow their 4th grade brethren into the Grand Final, going down to Easts in a close match. There is no doubt we had our chances, having the opposition 4 for 7 at one stage, but we just weren’t able to finish them off. Congratulations to Nick McLachlan and the team on a great season. Finally our Women’s season came to an end with the final Women’s U/15s match, with the Tahs getting the win against Mosman. If allowed the girls to finish 4th out of 10 teams in the first past the post competition, and again showed the promise that our Women;s program has. Jordan Daly has been missing most of the season due to a University placement overseas, and there has no doubt we have missed him. His calmness at the crease and stroke play all around the wicket on Saturday was testament to that, as he mounted a resilient rescue effort for 4th grade. Coming in at the unfamiliar #6 position, Jordan battled for 168 deliveries for his 86, falling short of what would have been a memorable hundred. He shared in a 9th wicket stand of 105 with Andrew Somerville to lead his side to a competitive 187. There was a fair amount of competition for the award, no doubt the 6/44 from Jesse Moffat mounted a strong case. But without Jordan, we never would have been in the game. 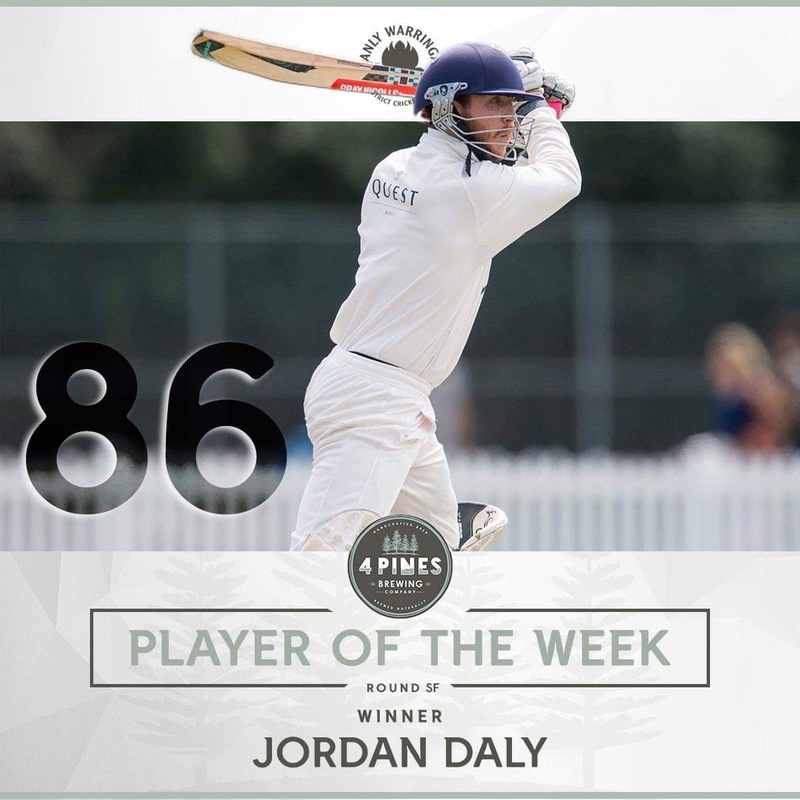 For his efforts, Jordan is this weeks 4 Pines Player of the Week. After another wet lead up to our Semi Final clash with Easts, we arrived at Waverley Oval with the ground generally in good condition on Saturday morning but with a slight delay due to a few random puddles. 30 minutes delay for a start at 11am. Winning the toss and batting we got off to the worst possible start with Sam Hole dismissed 2nd ball caught behind. We lost O’Sullivan and Ned Hole in quick procession, and then losing Matt Brewster we were 4/42 with a long road to get back into the game. However Vumbaca and Trewartha batted very intelligently for over an hour and a half and put on a fantastic 85 run partnership. However the threat of a collapse took it’s toll, and collapse we did. When Izzy went for a well made 46 when we were on 128, the rest of batting surrendered with little threat to the Easts bowling and we were all out for 141, losing 6/13 in the process. But that word “Collapse” reared it’s ugly, or in this case beautiful, head again as we started on fire with the ball. Easts were 4/7 before we new it and we were in the match up to our eye-balls. Easts recovered slightly to be 6 for 74 over night with the match well poised. However, Sunday was not the day we hoped it would be. Easts batted well and our bowling let itself down in the critical moments. Despite getting the 7th wicket with the score on 110, we weren’t able to make any more inroads and the Dolphins passed us 7 down. Congratulations to the Easts skipper Mark Morley on a match-winning 115*. He really was the difference between the 2 sides. So a good year from 3s that could have been great. Already looking forward to giving it another crack next season. The beautiful Tunks Park was the scene of 4th grades Semi-Final against Minor Premiers Sydney University. Winning the toss and deciding to bat after a half hour delay, it was a good pitch and outfield which is what you come to expect from the perpetual lower grade ground of the year. Openers Gummer and Cohen start in their usual cautious manner, getting to 0/28 before Cohen fell. It started a collapse of 4/19 that put us straight on the back foot. Our middle order battled hard but at 8/82 things were looking grim. Enter Jordan Daly and Andrew Somerville. In a match winning partnership that fell 9 runs short of the 4th grade 9th wicket partnership record, the pair put on 105 runs to get the Tahs to a match winning position. When Jordan was out for a fantastic 86, we had built up a defendable total. Somerville remained not out on 40, his highest score the the Waratahs. All out for 187. We finished the day with a wicket to the in-form Jesse Moffat with Uni finishing the day at 1/21. Day 2 started very conservatively for Sydney University, losing 2 wickets in the first session for the addition of only 32 runs. However they battled hard and got to 3/109 before a run-out just before tea got the ball rolling. Josh Wigney got an LBW with the first ball after tea, and it was then game on. From here it was the Jesse Moffat show. The great man took 4 of the final 6 wickets to almost single handedly bowl the Tahs to victory. He finished with 6/44 in a great display of bowling. He took the final wicket by knocking over the pegs to put the Tahs into the Grand Final. St George here we come. Our last game for season and what away to go out with the girls securing the opportunity to play at Manly Oval. Up against Mosman our girls were looking forward to the clash. With the overnight rain our start to the day was focused on removing water from the covers, job done we were ready for the toss of the coin. Nothing different to report here, we lost the toss and were sent into bat (same results for last 5 games). This week there was a change to the batting order with Ruby Gruber and Eliza Henry (7) pairing up as our new openers. Unfortunately it was long before our regular no. 3 Ellie James (8) was at the crease. Ellie and Eliza were looking good and got the score to 21 before unfortunately Ellie miss-hit a full toss and was caught. Her brief inning was highlighted by one of the shots of the day with a straight drive down the ground for 4. Ellie’s departure meant our captain Mia Nel joined Eliza. Mia did not disappoint, playing the perfect captains role with a very solid 20, providing some much needed stability to our top order. Mia’s innings was cut short by a very good ball that beat the outside edge of her bat. With Mia’s departure and at 7/55 the Manly the girls needed to bat deep, and that is exactly what Jess Manning (15) and Sophie Lowy (11) did. Both Jess and Sophie took control displaying some confident attacking cricket shots placing the pressure back on the Mosman bowlers. In the end the girls put on a 21 run 8th wicket partnership and a 16 run 9th wicket partnership progressing our score along to 92, meaning we had something we could bowl to. Confident at lunch that we could defend our total the girls were relaxed enjoying the surrounds of Manly Oval as well as the spread of food provided by our Manly catering team. Upon resumption of play we knew we had to be at our best with the ball, and as the day went on we were exactly that. Our opening bowlers Caitlin du Prezz (0/5 off 4), Mia Nel (2/6 off 4) set the tonne from the outset. And as the innings progressed the Manly girls kept themselves in the game with a consistent flow of wickets as well as maidens. In total we bowled 7 maidens, and if you count the last over it would have been 8 from 31. Maya Nicey (2/9 off 4) also bowled an excellent line an length with her left arm spin. Jess Manning (1/5 off 3), Stephanie Hughes (1/9 off 3), Ellie James (1/0 off her 3.4 overs) and Emily Horstead (1/11 off 2) were our other wicket takers. In the field our girls were sharp, we held our catches including a classic by Stephanie Hughes at first slip, taking a catch done low on her left side, as well as executed a couple of run outs featuring sisters Jazzy and Ellie James. The run out to end the match and season was fitting, a team effort and a demonstration that the hours of fielding practice the girls have put in pays off. Manly securing a win for the last game for the year and our first game on Manly Oval. With the post-game wrap up concluded, it was an opportunity to thank coach Ross Denny for his continued support towards Female Cricket, as well as his commitment and endless hours he has put in to this team. Ending the season with 3 wins from the 5 games. It may have been a pilot competition the CNSW, but for the Manly girls and supporters is was a success and a very enjoyable way to spend 6 weeks together finishing off the season and improving our cricketing skills. 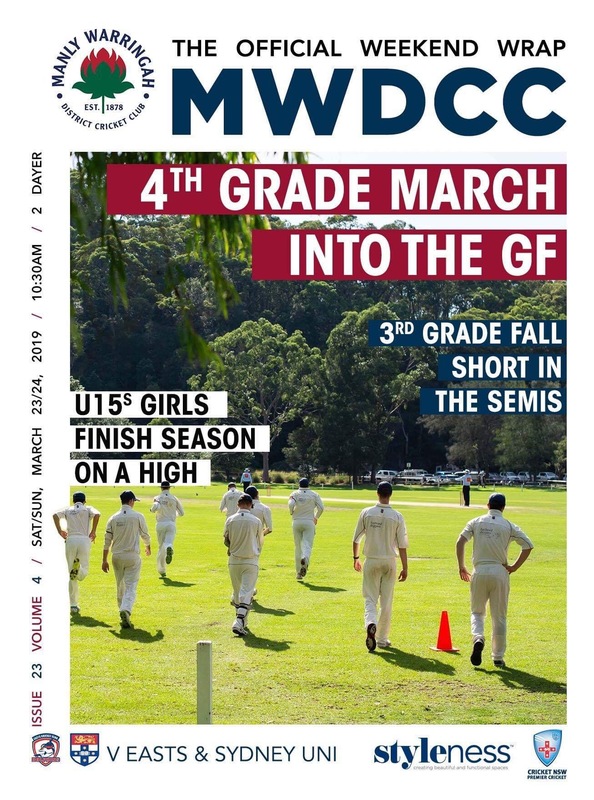 We all hope the competition is back next year and we thank Manly Cricket for their support.